When we planted our first 25,000 strawberry plants in 2001, none of us imagined that Jelli’s Market would blossom into what we have today. The primary intent at the beginning was to earn a little extra money for our 3 girls’ college funds. Our first few years growing 4 acres of strawberries worked out pretty well, so we expanded to about 10 acres and thanks to the encouragement of our customers, we also planted 2 acres of raspberries. As the years passed, it seemed that we were adding a new enterprise each year. Currently, we grow 12 acres of strawberries, 2 acres of raspberries, 2 acres of blueberries, 1 acre of asparagus and about 20 acres of sweet corn. We also start our own vegetable plants in our greenhouse to plant in our 2 acre garden-everything from broccoli to zucchini. Extra vegetables, annual flower bedding plants and a few hundred hanging baskets are sold out of our greenhouse each spring. In 2009 we formed a partnership with a neighbor and planted an apple orchard. This added a whole new “season” for us. Now we start with asparagus and the greenhouse in May, move on to strawberries and other produce during the summer, then on to apples and pumpkins in the fall. We currently have close to 5,000 apple trees, a few hundred peach trees, and an assortment of pear and plum trees. A large percentage of the apple trees are Honeycrisp, but we have everything from Macintosh to Snowsweet apples as well. 2011 brought the addition of a much needed Farm Store which we built inside of an already existing pole shed on the farm. All of our produce is sold in the Farm Store along with our very own farm raised meats. We proudly raise Angus beef, pork, lamb, chicken, and turkey on our farm. Our meat has become quite popular with our customers over the years! Our youngest daughter, Libby, graduated from high school in 2016. Our newest and largest project so far was just completed in the fall of 2017. The desire to make the best use of our extra produce and requests from our customers resulted in a decision to build a commercial kitchen. We are now capable of making our own jams, pies, apple cider donuts and other baked goods in our own kitchen. With the kitchen came new bathrooms, a walk in cooler and freezer and a temperature controlled meeting room. We hope this new venture allows us to serve our customers even better in the future! All of these improvements and the continued growth of our market has only been possible by the continued dedication of our entire family. Steve and Jody Knoebel own and operate the business, and their daughters Jessica, Lindsay and Libby, have very strong ties to the running of the operation. 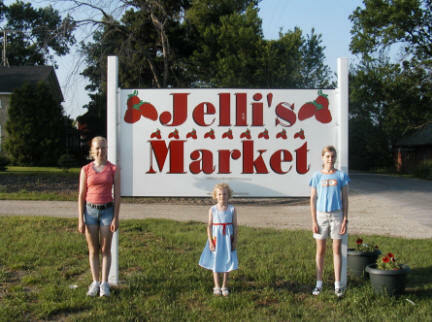 The name of our market is a combination of the 3 girls names – Jelli’s! Jessica has a full time job off the farm, but stays involved in the farmers markets, computer updating and bookkeeping part of the market. She has been the “face of Jelli’s” at the Waukesha Farmers Market since we started attending 10 years ago. Lindsay came back to the farm full time after graduating from college. She currently oversees the crop protection part of the operation and manages the fall produce enterprise. Lindsay also has a second job as a seed salesperson for Pioneer Seed. Libby is attending college at UW-River Falls, but returns to the farm in the summer to oversee the group tours and manages the pre-picking employees. No business can succeed without the dedication of the people who work for it and we are certainly very blessed to have a wonderful core of exceptional employees. Without their enthusiasm and hard work we could not succeed. Stop by and see us – we LOVE having old and new friends visit us! At Jelli's Market, we strive to produce high quality products using environmentally safe agricultural practices. We practice sustainable agriculture and incorporate integrated pest management (IPM) as much as possible with our fruits and vegetables to control unwanted pests.